Fabulous fall foliage tells you a little something about 'Purpurascens' but they also make amazing hedges, are very drought tolerant and produce plumes that birds love to feed on! This Flame Grass lives up to its name in the fall when its medium green foliage turns a fiery-red colour! 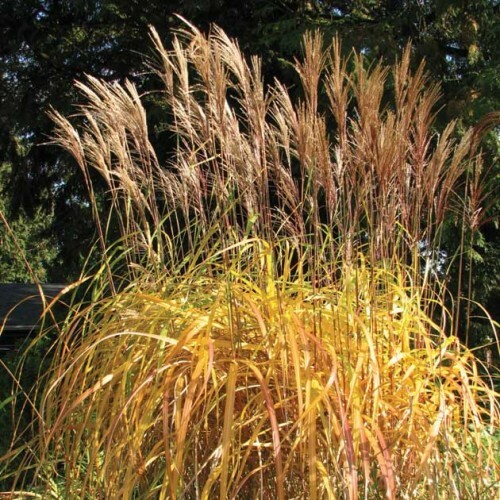 Miscanthus 'Purpurascens' features medium green blades with a reddish tinge that will develop into reddish hues as summer progresses, eventually turning a brilliant orange-red in fall! Foliage gradually darkens to an attractive burgundy by winter. Tiny reddish-tinged flowers appear above the foliage in late summer and gradually turn into creamy white plumes by fall. The burgundy coloured foliage and creamy white seed plumes then continue well into winter providing good winter interest. This grass is easily grown in average, medium wet, well-drained soil in full sun to partial shade. 'Purpurascens' clumps slowly expand in circumference by short rhizomes, but retain a tight clump shape. Its foliage should be left standing throughout the winter for visual interest and to provide protection for the crowns. Cut foliage to the ground in late winter just before new shoots appear.